Dungannon Swifts manager, Rodney McAree. Photo by TONY HENDRON/Presseye.com. Rodney McAree admits that fixtures don’t come much bigger than playing the champions in their ‘own back yard’ . The County Tyrone boys have made an impressive start to the Danske Premiership campaign, having pocketed eight points from their six starts that has propelled them to fifth place in the table. However, McAree reckons this will be their biggest test so far, but it’s one he is relishing. “We’ve had a difficult start to the season,” he said. “To come away from a series of tough matches with eight points in the bag is encouraging. We lost our first two (against Glentoran and Ards), but since then we’ve beaten Coleraine; won at Cliftonville; drawn at Windsor . . . and lost a two goal lead at home to Ballymena United last week in a game that also finished all square. “Normally, I wouldn’t have been too pleased, but I have to give credit the way Ballymena battled back. We were brilliant for 25 minutes -- but then stopped! “It was frustrating, but Ballymena made it difficult for us. To be honest, it was a game that we would have lost last season, so I have to give the players credit. “I think the boys are playing with a wee bit more freedom and that is down to the start we have made . . . they are all playing with a bit of confidence. “But Crusaders are a different animal, especially at Seaview. They managed to grind out a last gasp win at Ards last week . . . that’s whey the are champions. 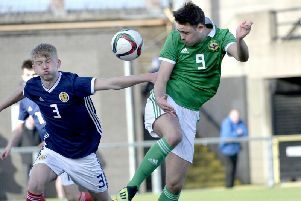 Crusaders will be without midfielder David Cushley, who was dismissed last week against Ards, but flying winger Gavin Whyte returns from Northern Ireland Under-21 duty and will be included in the squad. “Dungannon have made a fine start to the season, so they will hold no fears coming to our place,” said Crues boss Stephen Baxter.